As much as I love being on my island (ok, fine, smoky-sweltering-city-within-an-island), I can’t help fall in love with every other place I visit. It’s just me. I am the wide-eyed traveler. I can never seem to affect a pose of sophisticated ennui. Unlike that Cole Porter song, I get a kick out of everything. On one hand, I come off as a silly panting puppy. On the other…well…can you imagine what kind of wonderful sensory overload it is to get a kick out of everything? You should try it. I will be well fed anywhere in the world I go. I love the Swiss and the Swiss love me. The gods still walk around Athens. I don’t mind when Italians lie to me. I like it. There was something greater than us humans at work in ancient Egypt. I will someday live in a log house in the Finnish woods (yes, with Moomin). Scandinavians are my long lost relatives. Even if we don’t speak the same language, if you are Asian (as I am) we will understand each other. Somewhere deep inside me lurks a cute French girl struggling to come out. I’ll stop here before it becomes apparent that I am indeed totally off base. Oh, you already know? Don’t tell anyone. Anyway…the cute French girl in me. She needs to be fed. Thank goodness Bron chose clafoutis as the theme for this round of Hay Hay it’s Donna Day! But…but…despite all this fantasy identities, I am still an island girl at heart. 100% Filipino. So my clafoutis has mangoes and chicos. Mangoes from the Philippines are in my (and a gugillion other) opinion the best in the world. Chicos are another local fruit that have always been a favorite of mine. Less popular than the mango, it has its lovers and its haters…and I am firmly in the lovers camp. It is sweet, sandy/grainy, juicy, and somewhat, I can’t find a better word than…booze-y. 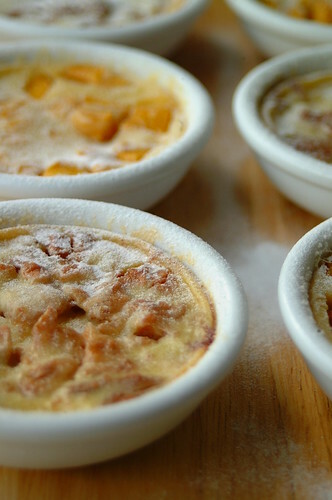 Both fruits are in season now so the timing was perfect for a tropical clafoutis (omg! Is that what I am?). You can find Bea’s recipe I used here. Just substitute the cherries for half mango and half chico. Also, I didn’t add the crushed biscuits and pistachios. The mango clafoutis was good…but not as good as I expected, considering I worship this fruit. I suppose for me, the best way to eat a mango is plain, with nothing to detract from its inherent perfection. The chico clafoutis however was a revelation. I honestly didn’t know how it would turn out, as the chico is seldom used in baked goods (yes, the occasional chico panna cotta in some fusion-y restaurant sometimes). It was a nice surprise biting into it…the chico had firmed up somewhat in the oven and it’s sweet, grainy self was a great match for the smooth custard. I am leaving tonight for Hanoi (yaaaay!!!!) so I’ll stop here. I still have a mountain of work to finish, plus packing, plus making sure the flat is at rights before we go. I’ll see you all when I get back, hopefully with lots of photos and highlights to share, and for certain with a few more pounds on me.